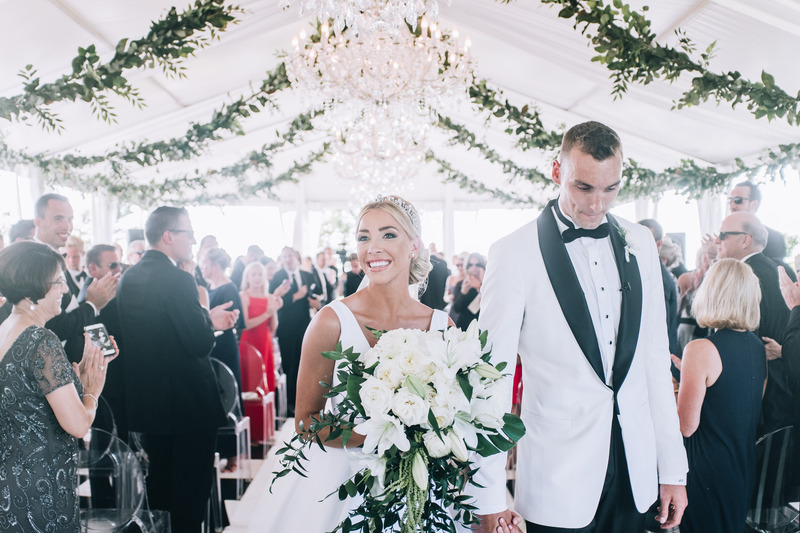 Although ESPN reporter Olivia Harlan and L.A. Clippers player Sam Dekker grew up just two hours away from each other in Wisconsin, it wasn’t until a mutual friend introduced them that their love story took flight. “She said we had so much in common, and it was obvious we’d be the perfect match,” Harlan, 25, tells The Knot. At the time, distance was a factor, and career was too. “I was living in Atlanta and covering the NBA, so when I heard he was an NBA player, I said, ‘No way!’” Harlan jokes. “My friend gave him my number anyway, and I took my time to respond. Once we started talking, though, I couldn’t deny that she was right.” Harlan says that Dekker, 24, was “so persistent” that he quickly won her over. The pair dated for eight months before the athlete popped the question. 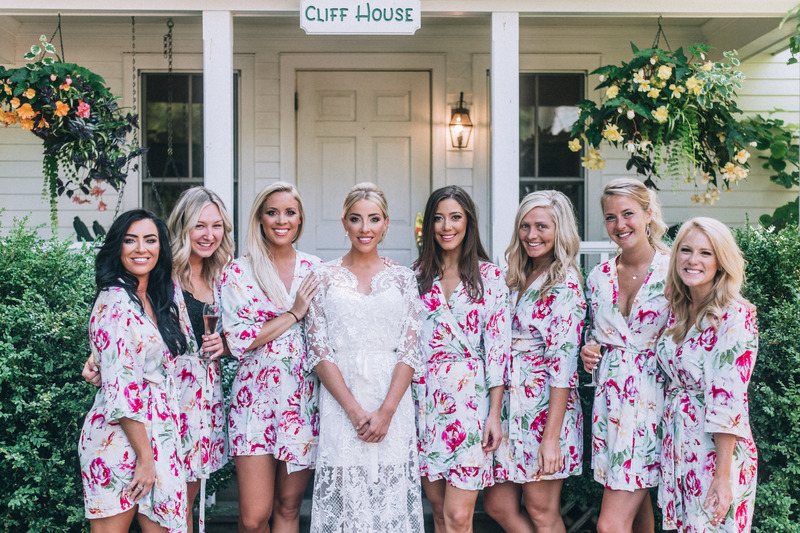 Here, The Knot scopes out all the details that the newlyweds incorporated into their July 14th nuptials, including not one, but two cocktail hours. OLIVIA HARLAN + SAM DEKKER – THE TRAILER // DOOR COUNTY, WI from CAPTIVATE // ONE FINE DAY on Vimeo. 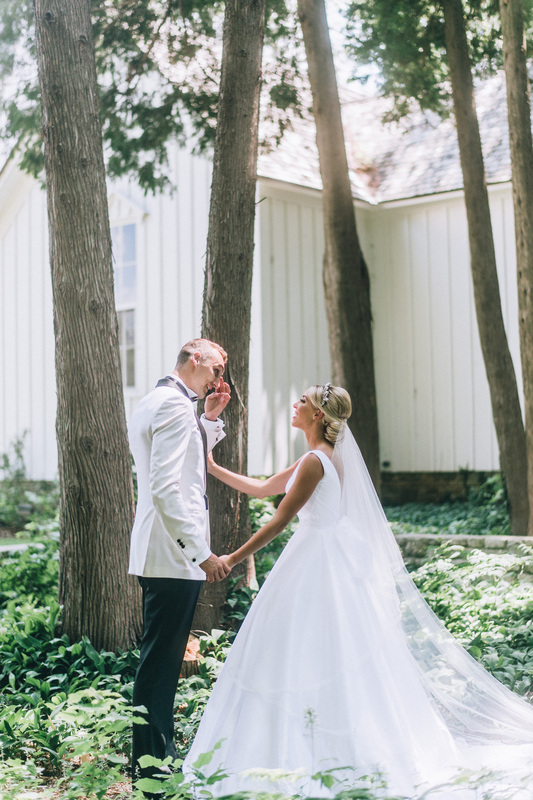 Though the wedding itself wasn’t held at a church, Harlan and Dekker did take a moment after the first look to bow their heads in prayer and reflect with their minister. 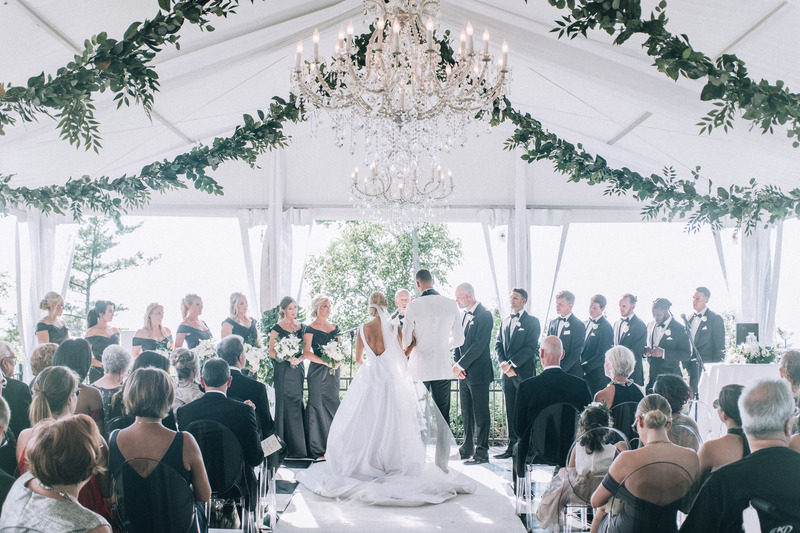 The couple also did a sand ceremony after exchanging vows, layering sand in a vase from a wide range of their joint life experiences: Israel, where the couple traveled to the previous year; Sheboygan, where Dekker is from; and Door County, where Harlan is from. 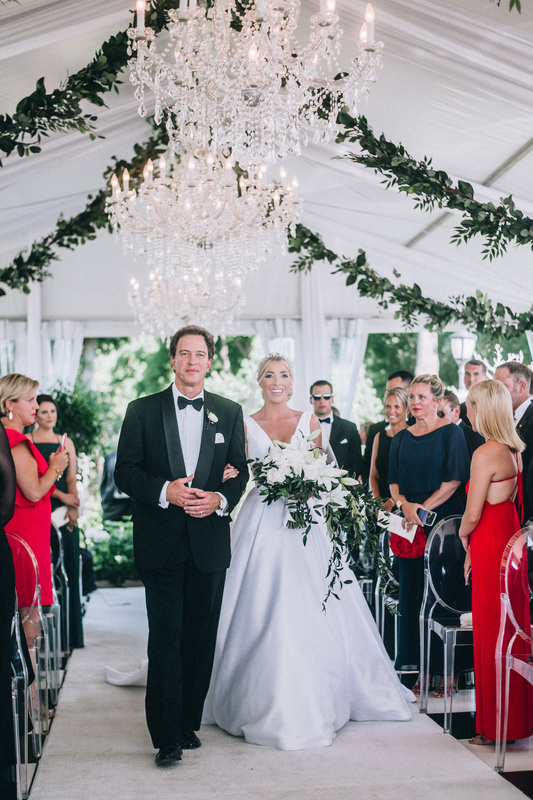 In keeping with their classy theme, Harlan and Dekker made sure that the reception, which was held in the same tent where the ceremony had been, was transformed into a fun space for guests to relax and enjoy themselves. “We did warm white uplighting around the dining room, and flooded the place with candles,” Harlan says. “Lighting is so important. We [also] transformed the tent from the ceremony to party. 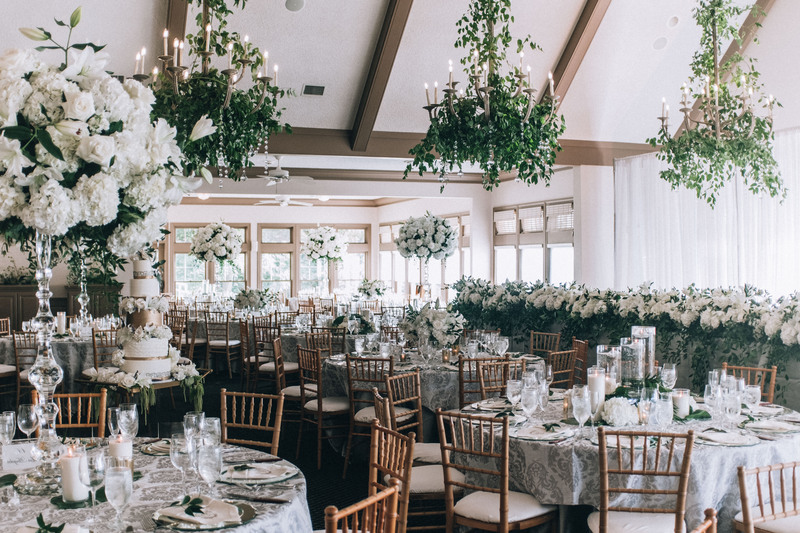 They added more greenery, high top tables, brought in antique furniture, and the band. It looked like a whole new area. 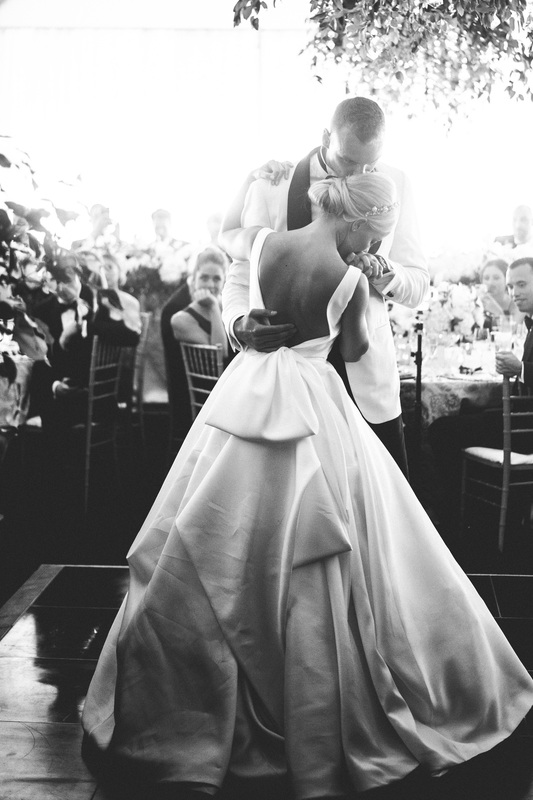 For her wedding gown, Harlan says she wanted to look like a “modern day Grace Kelly,” and worked with a designer to customize a dress by Sareh Nouri, combining three of the Nouri’s designs to create the perfect gown: the bodice of one, the skirt of another and the bow of yet another. 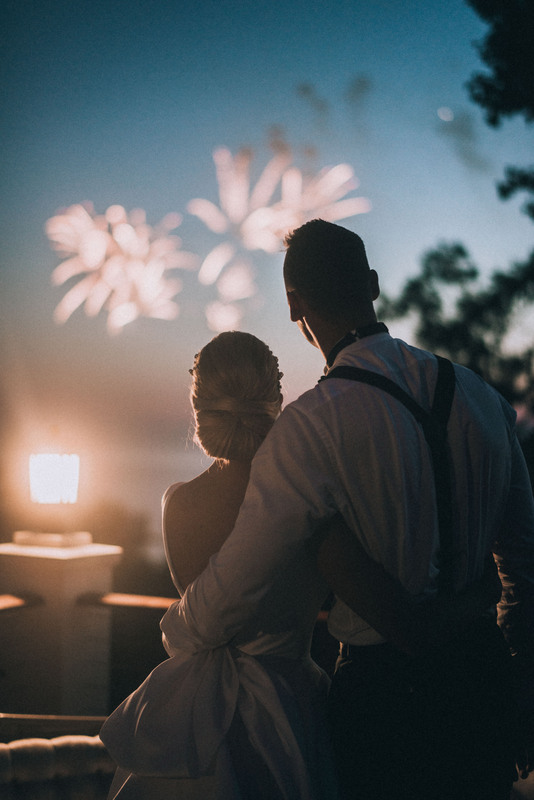 The result was a brilliant white gown with a fitted, boned V-neck top and full ball gown skirt (with pockets) and a long train for a modern look on a classic style dress,” Harlan says. To balance out the simpler Grace Kelly-esque gown, Harlan went with an elaborate headpiece by Maria Elena, which added height and sparkle to the overall look. Harlan’s shoes were a pair of Bella Belle open-toed booties with lace and pearl detail, and her garter was perhaps the most unique of all, a custom-made design by La Gartier that incorporate pieces of her mom’s wedding dress, Dekker’s Clippers jersey and their wedding date pendant. Harlan’s diamond earrings were a gift from her groom, and her purse was worn by many brides in Dekker’s family. 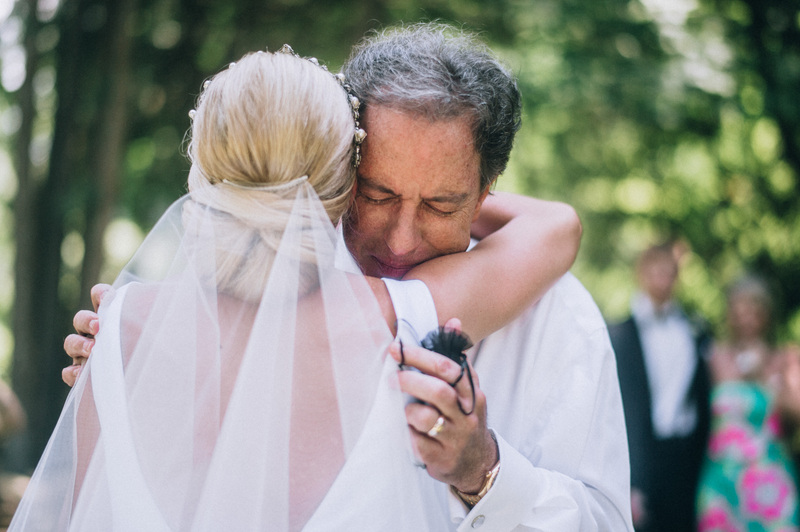 (Talk about a great something borrowed). Dekker donned a custom tuxedo by Balani customs, due in large part to his tall frame (he stands tall at an impressive 6’9”). The look included an ivory jacket, a black shawl collar, white shirt and black fitted pants. To add a bit of texture, Dekker also went with a velvet bow tie and velvet formal slipper, completing his classic, stylish look. 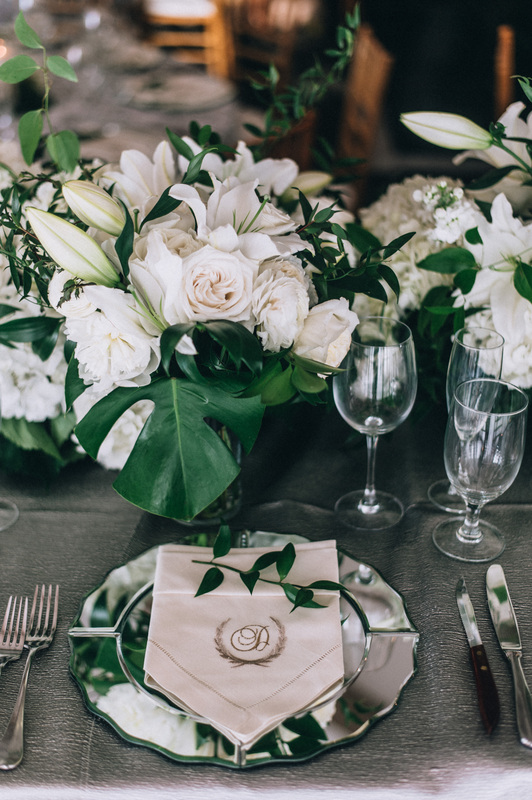 The main flowers at the ceremony and reception were Harlan’s favorite: white casablanca lilies and monstera leaves. “The dark waxy green of that leaf looked so pretty with softer whites and light greens,” she says. 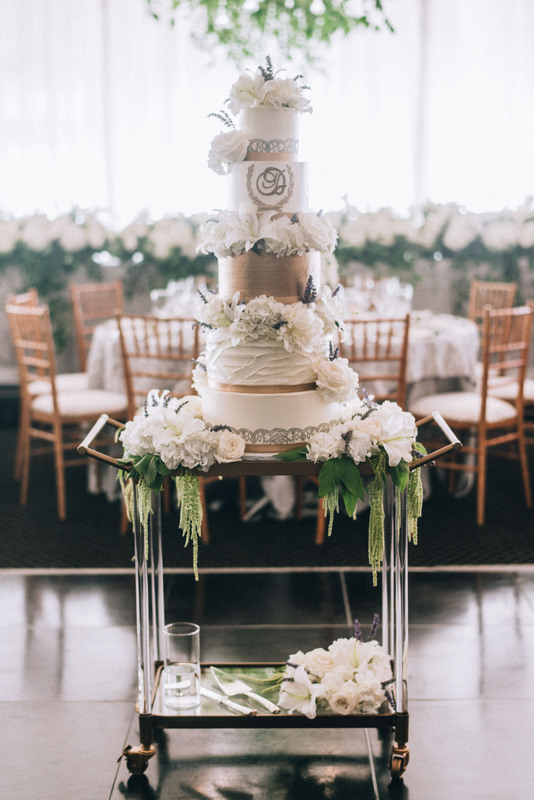 “We wanted very over-the-top, drippy, dreamy flowers.” Harlan’s bouquet was “big, asymmetrical and whimsical.” Dekker and his groomsmen wore white ranunculus boutonnieres. At the reception, there were ficus trees in the tent and lavender incorporated throughout. On the menu for the evening: halibut with chive creme fraiche, roasted pepper fennel slaw and fillet with cabernet demi-glaze. The couple also had custom cocktails at the ready for their two cocktail hours: a “Dekkerita” signature drink for the first cocktail hour, which featured mezcal, jalapeño agave and a smokey ice cube. For the second, the “sunset cocktail hour” post-dinner, the couple served up traditional Wisconsin supper club drinks: a grasshopper, a brandy alexander, and a pink squirrel. 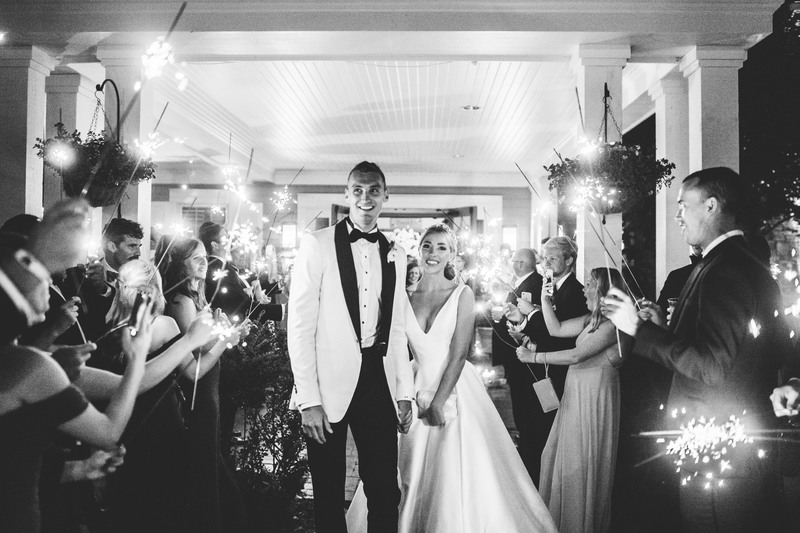 Be the first to comment on "Exclusive: ESPN Reporter Olivia Harlan and NBA Player Sam Dekker’s Wedding Album"